Finished career as leading active scorer in Big 12. Ranked second with 99 double-figure scoring games . Ranked No. 3 in Mountaineers’ history for career points (2,001) and made FGs (731). Became only second player in program history to earn all-conf. First Team honors three straight years and first with 500+ points three consecutive years. 2015-16: Unanimous All-Big 12 First Team after finishing 3rd in league in scoring. 2014-15: Team captain; unanimous All-Big 12 First Team; and All-America Hon. Men. (AP, WBCA). Ranked 2nd among Big 12 scorers. Tallied 716 points, second most in a single-season at WVU; posted double-figures in program’s single-record 37 games. 2013-14: All-America Hon. Men (AP) and unanimous All-Big 12 First Team selection after leading Mountaineers in scoring, 3PFG%, steals. PREP: Helped Hillhouse to three straight state titles. 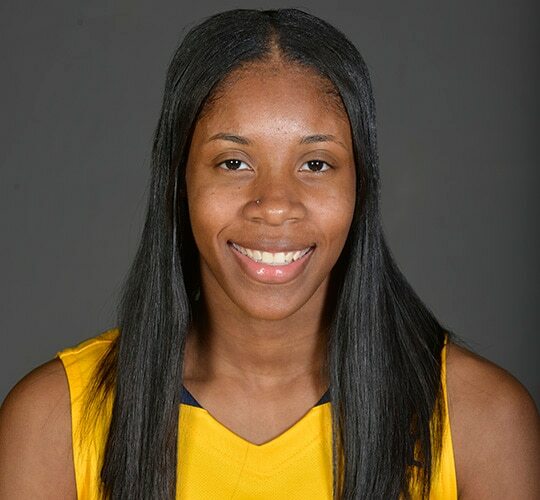 MISC: Became engaged on WVU Senior Day game when boyfriend Oterrious Diggins proposed during postgame interview after she had tallied a game-high 27 points in win over Okla. State (2/27/16).